Public school systems are cheerfully decorated dictatorships: discipline, standards, and testing are the driving concepts of modern k-12 education. The very reason why districts purchase bundles of the same textbooks is so they can keep classrooms in lockstep alignment as teachers meticulous meet timely instructional goals. Amplify, NewsCorp’s new education division, finally revealed its long-awaited flagship product: a sophisticated tablet designed specifically for schools, which many finally be the perfect bureaucratic blend of classroom management, assessment, and monitoring that schools need to adopt technology en mass. But what in the sam hill is News Corp. doing messing around in education? Well, it’s true that Rupert Murdoch is one of the more well-known (and polarizing) figures in the media landscape; his reputation precedes him, and it’s not one that’s typically been associated with education reform. While the News Corp. founder’s sudden transformation into an education reform advocate may seem a head-scratcher, the motivation becomes clear when, in Murdoch’s terms, one considers that K-12 education is a $500 billion sector in the U.S. alone — and one that remains relatively untouched by corporations like News Corp.
A little over two years ago, Murdoch set out leverage the News Corp. brand to help fix a public education system that, in his words, has “lower standards than American Idol,” hiring one of the more prominent figures in American education, former chancellor of New York schools, Joel Klein, to pursue opportunities in EdTech. With Klein as his new education guru, the pair quickly made their first big strategic move, acquiring New York-based software, assessment and data services startup, Wireless Generation, for a whopping $360 million. However, News Corp.’s plans for education were quickly derailed by the infamous phone-hacking scandal that forced Klein leave his position to lead the company’s internal investigation. After two years of investigations, trials and more, News Corp. rebranded its education unit last summer as “Amplify,” revealing some of the basic tenets that would shape its digital strategy, which include “assessment via mobile tools, curriculum design and the online distribution of resources via AT&T-powered tablets,” as Greg wrote at the time. Klein and company are convinced that, for public education reform to be successful, the private sector needs to get more involved — as does the role of technology in the classroom to help both teachers teach more effectively and help students learn. 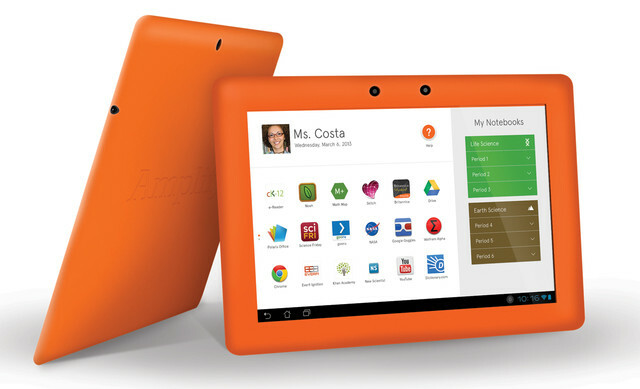 Amplify attempts to put those ideas into practice, by allowing the company to not only sell its curriculum on any tablet makes its way into schools, but by betting that schools will be willing to fork over a pretty penny to access blended learning tools (and an infrastructure to store learning data) all through a custom tablet. Of course, Ammplify isn’t the first to offer these types of learning tools on mobile devices, as many startups (and even bigs like Pearson) already have similar cross-platform, web-based tools on the market. However, no particular device or platform has emerged as the clear leader, and by offering classroom management tools and features that one would expect from News Corp, like a kill switch that allows teachers to limit students’ access to apps on the tablet, Amplify hopes to get a leg up. As to those features: Amplify’s Android-based 10″ tablet comes preloaded with all the basic learning software that teachers need to dole out information on any given subject: textbooks, multimedia lessons, Encyclopedia Britannica, and a graphing calculator. It even includes the widely popular Khan Academy suite of YouTube-based lectures, which were recently converted to an off-line textbook-style format. More importantly, Amplify’s tablet suite is a managerial dream: teachers can carefully monitor students behavior, administrators can deploy content across an entire grade-level, and districts can evaluate schools with custom standardized tests. Amplify gives teachers, as both disciplinarian and educator, impressive control. They can selectively enable or disable apps to direct student learning; distracted students get an “eyes on teacher” alert if their usage behavior indicates an inattentive mind. Impromptu polls and tests individually evaluates each student and gives them customized refreshers. 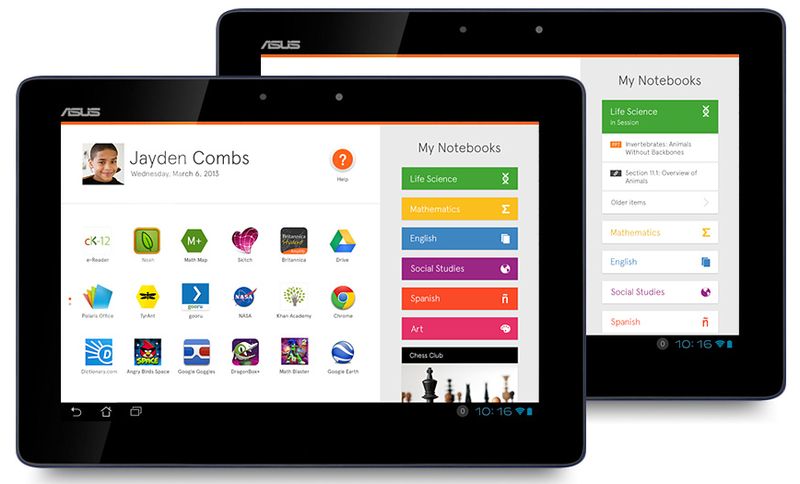 The very cost-structure of the tablet system is designed for administration. Even with a two-year subscription at $99 per year, the wifi-enabled tablet is still a pricey $299 (a 4G version is $349 with a $179/year contract). But, it’s meant to be purchased by whole schools, districts or states, and comes with 24-hour live technical support to ensure students are meeting goals in a timely fashion. If schools could replace some of their textbooks and IT overhead, the cost appears less daunting. But, it’s still high. Just as important, Amplify has been built around the Common Core, a new national curriculum guideline emphasizing career and college readiness. Yet, since the federal government can’t set national standards, schools have been left to fend for themselves and develop their own tests. Amplify’s evaluation wing aims to ease the confusion and develop a reliable set of measures that can easily be distributed school-wide with the click of a button. During Greg’s interview with Amplify CEO Joel Klein at Techcrunch’s Disrupt San Francisco, he made it clear that all of the wonderful hardware in the world won’t make a difference unless it’s built for the schools and teachers. There’s already a crowded market of education technology, from classroom management software ClassDojo, to tablet software from textbook giants McGraw-Hill and Pearson. Successful players in the education space knew that schools need scale, structure, and support. When Google entered the market, they got buy-in from state-level officials and now have over 20 million users. Klein, knows that education is a game of Monopoly: provide a school everything and ye shall receive everything. The result, in this case, may be the push that the education system needs to enter the 21st century.